Several routes lead to Ottawa: Highway 417 from the east, take Mann Ave and follow straight onto King Edward (you will see the sign), this will lead you to the Quebec side. Do not take the Nicolas Ave exit as that will take you right downtown instead of around. Highways 416 from the south and highway 7 from the west, when you reach Ottawa, take the 417 to Nicholas Exit and take your first right (Laurier) and go a couple of blocks to King Edward and turn left. This will bypass downtown. NOTICE: Heavy traffic through Ottawa from 3:15 to 5:30 during week days. If you are coming later you may want to have dinner before you arrive. In the winter all season radials are no good up here! IN THE WINTER YOU NEED GOOD SNOW TIRES FOR THE HILL, NOT ALL SEASON TIRES! Take the second exit over the bridge, and follow directions to Montreal (Hwy. 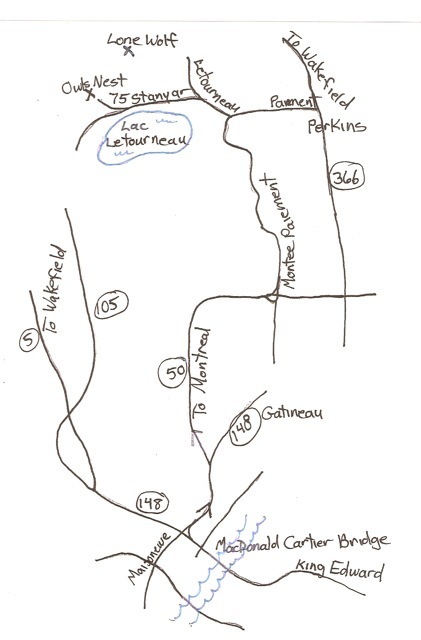 50), go about 8 km to the Montee Paiement.